Henry Blake was born November 27, 1815, in Maryland, and died April 3, 1901, in Clearfield, Clearfield Co., PA, at age 85. Buried in Kylertown Presbyterian Cemetery, Morrisdale, Clearfield Co., PA. He is the son of James Blake Jr. of Pennsylvania, and Sarah Ann Unknown of Pennsylvania. Jane P. Bush was born March 22, 1815, in Pennsylvania, and died February 11, 1873, in Union Twp., Centre Co., PA, at age 57. Buried in Bush Hollow Cemetery, Centre Co., PA. She is the daughter of Henry Bush Sr. of Union City, Centre Co., PA, and Sarah Brower of Patton Twp., Centre Co., PA.
Henry Blake and Jane P. Bush were married about 1836 in Pennsylvania. James H. Blake: Born about 1837 in Pennsylvania; Died October 5, 1862, in Mt. Pleasant G H, Washington, DC (about age 25). Buried in U. S. Soldiers' and Airmen's Home National Cemetery, Washington, DC. Married November 8, 1860, at Andrew Bainey/Baney's house by Rev. M. L. Jackson, Pennsylvania, to Hannah Stratton: Born February 17, 1835, in Centre Co., PA; Died January 22, 1906, in Runville, Boggs Twp., Centre Co., PA (age 70). Buried in Advent Cemetery, Milesburg, Centre Co., PA.
Sarah Jane Blake: Born January 13, 1838, in Clarion Co., PA; Died November 28, 1908, in Rurfued, Crawford Co., PA (age 70). Buried in Penfield Cemetery, Penfield, Clearfield Co., PA. Married about 1855 in Pennsylvania to Alexander Loder: Born December, 1820, in Jersey Shore, Lycoming Co., PA; Died August 8, 1890, in Penfield, Clearfield Co., PA (age 69). Buried in Penfield Cemetery, Penfield, Clearfield Co., PA.
Anna E. Blake: Born January 27, 1840, in Centre Co., PA; Died July 27, 1927, at her home, Wilkes-Barre, Luzerne Co., PA (age 87). Buried in Hanover Cemetery, Hanover Green, Luzerne Co., PA. Married 1862 in Pennsylvania to Rufus D. Stratton: Born February 1, 1838, in Boggs, Centre Co., PA; Died October 18, 1915, at his home, Wilkes-Barre, Luzerne Co., PA (age 77). Buried in Hollenback Cemetery, Wilkes-Barre, Luzerne Co., PA.
Martha Amelia Blake: Born August 8, 1841, in Union, Centre Co., PA; Died June 10, 1909, in Otoe Co., NE (age 68). Married October 1, 1861, in Centre Co., PA, to William Moses Peters: Born January 3, 1828, in Union, Centre Co., PA; Died December 11, 1914, in Loup City, Sherman Co., NE (age 86). Margaret Mary Blake: Born about 1843 in Pennsylvania; Died after 1860 in Unknown. William Blake: Born November, 1844, in Pennsylvania; Died October 21, 1918, in Houtzdale, Clearfield Co., PA (age 73). Married about 1867, in Pennsylvania, to Mary J. "Jennie" Howder: Born December, 1846, in Pennsylvania; Died May 25, 1927, in Rush, Centre Co., PA (age 80). Charilla Lucas Blake: Born August 6, 1847, in Pennsylvania; Died July 14, 1922, in Susquehanna, Cambria Co., PA (age 74). Buried in Kylertown Presbyterian Cemetery, Morrisdale, Clearfield Co., PA. Married 1865 in Pennsylvania to Isaac E. Shoemaker: Born September 24, 1839, in New York; Died September 11, 1909, in Pennsylvania (age 69). Buried in Kylertown Presbyterian Cemetery, Morrisdale, Clearfield Co., PA.
Mary M. Blake: Born September, 1852, in Pennsylvania; Died January 22, 1935, in McMinnville, Yamhill Co., OR (age 82). Buried in Sunset Memorial Park, Coos Bay, Coos Co., OR. Married (1) about 1873 in Pennsylvania to Unknown Waters: Born Unknown in South Carolina; Died Unknown. Married (2) 1878 to Andrew James Arnot: Born November 18, 1850, in Elmira, Chemung Co., NY; Died November 9, 1929, in Roseburg, Douglas Co., OR (age 78). Buried in Sunset Memorial Park, Coos Bay, Coos Co., OR. Mary's daughter, Alice Elizabeth (Waters) (Throne) Clarke was born April 24, 1872, in Pennsylvania, and died June 5, 1935, in Roseburg, Douglas Co., OR, at age 63. Buried in Roseburg Memorial Gardens, Roseburg, Douglas Co., OR. She married Norman Franklin Throne: Born September, 1871, in Pennsylvania; Died August 8, 1913, in Jackson Co., OR (age 41). Buried in Mountain View Cemetery, Ashland, Jackson Co., OR. Thompson Milligan Blake: Born October 27, 1853, Pennsylvania; Died October 24, 1927, in Susquehanna Twp., Cambria Co., PA (age 74). Buried in Kylertown Presbyterian Cemetery, Morrisdale, Clearfield Co., PA. Married about 1882 in Pennsylvania to Henrietta "Nettie" Runk: Born about 1855 in Rush Twp., Centre Co., PA; Died Unknown. Their child, Mary A. "Mamie/Minnie" Blake, born June 22, 1884, in Philipsburg, Centre Co., PA, and died January 22, 1966, in Altoona, Blair Co., PA. Married Robert Bruce Moore in 1905 in Altoona. Lola Monte Blake: Born about 1863 in Pennsylvania; Died after 1910 in Unknown. 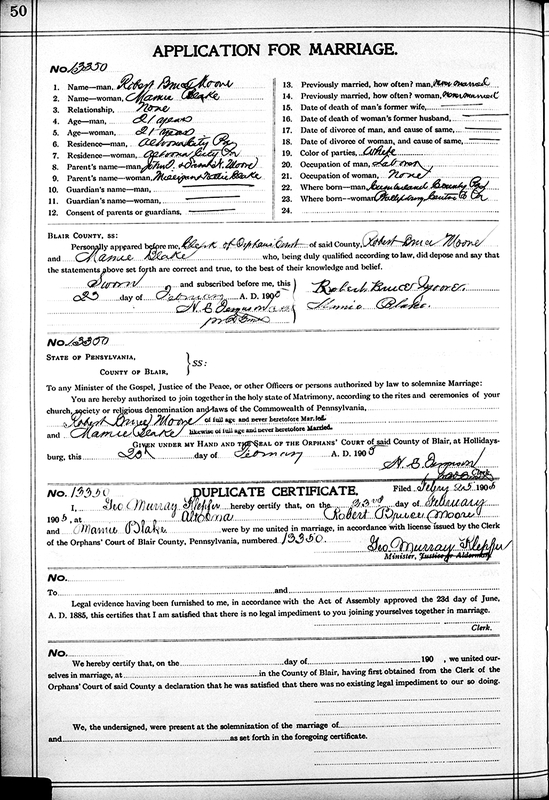 Married May 1, 1902, in Wills, PA, to James Morrow Maxwell: Born Unknown; Died Unknown. Henry Blake is buried in Rodman Cemetery, Roaring Spring, Blair Co., PA. Thanks to Find-A-Grave for making this image available. Jane P. (Bush) Blake is buried in Bush Hollow Cemetery, Centre Co., PA. Thanks to Find-A-Grave for making this image available. James H. Blake is buried in U. S. Soldiers' and Airmen's Home National Cemetery, Washington, DC. Thanks to Find-A-Grave for making this image available. 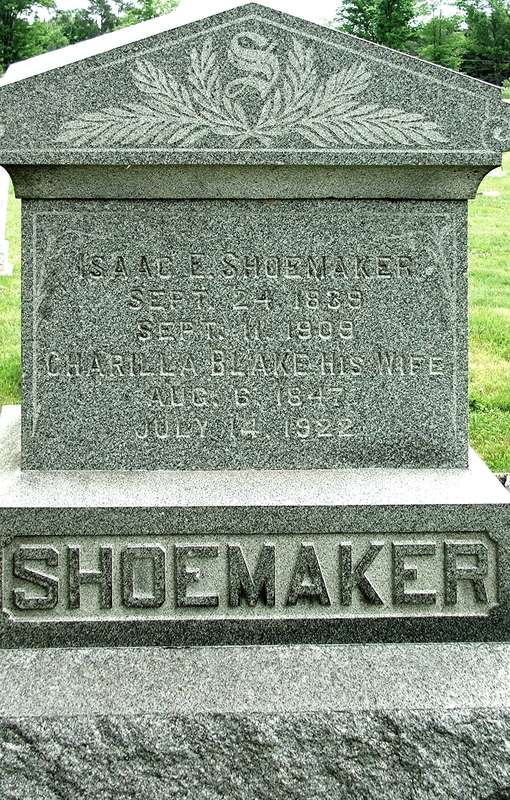 Isaac E. Shoemaker and Charilla Lucas (Blake) Shoemaker are buried in Kylertown Presbyterian Cemetery, Morrisdale, Clearfield Co., PA. Thanks to Find-A-Grave for making this image available. James Blake Jr. was born January, 1793, in Pennsylvania. Sarah Ann Unknown was born 1795 in Unknown. Sarah (Unknown) Blake died about 1798 in Pennsylvania, at age Unknown. After Sarah died, James married Ann Unknown about 1799 in Pennsylvania. Ann was born about 1783 in Unknown and died before 1834 in Pennsylvania at age Unknown. She was the daughter of Unknown. James Blake Sr. and his first wife, Sarah (maiden name unknown), had five children according to the family record: Elizabeth, Thomas, James, Henry, Simon. There appears in the Salem Lutheran Church record of Lebanon, PA, the baptism of an Isaac Blakes on Nov. 30, 1798 whose parents were James Blakes and wife. No further record of this child has been found, neither do we find a census record for James for the year 1800 so it may be assumed that wife and child may have died and that he was living with his five children with relatives in Pennsylvania or Maryland. He must have remarried shortly after Sarah's death for Ann is the mother of Burdine who was born Jan. 13, 1800. Another child of this marriage, Maria, died in 1804. The census of 1810 finds James Blake in Drumore Township. In 1815 he buys land from George Withers, iron master, for a consideration of $4,208.00, sells some of it in 1823 as a resident of Woodbury Twp., Bedford Co., but he is listed as a non‑resident taxpayer in Drumore Twp., from 1816 to 1828. During this period he was probably working in the furnaces of Huntingdon Co. for we find him and his son, James, in Woodbury township of that county for the 1820 census. These two Woodbury townships should not be confused with each other; Woodbury of Huntingdon Co., and North Woodbury of Bedford are now in Blair Co.
Henry Blake was born November 27, 1815, in Maryland. Jane P. Bush was born March 22, 1815, in Pennsylvania. Ann (Unknown) Blake died before 1834 in Pennsylvania at age Unknown. After Ann died, James Blake Sr. married Polly Unknown about 1835 in Pennsylvania. Polly was born about 1786 in Pennsylvania and died August 1876 in Pennsylvania at age 90. She was the daughter of Unknown. James and Polly had no children. Deeds and Orphans Court Records show that James and his sons James, Simon and Burdine with their families were living in Blair County in the vicinity of Martinsburg by 1830. James's will provided that his wife, Polly, was to receive yearly rental or full possession of lot and two houses in Martinsburg as long as she remained a widow. At her death or marriage said property was to be sold and proceeds to be divided equally between "my three sons: James, Simon, and Burdine. Eldest son, James, to have farm on which I now reside, about 70 acres, also desk. Burdine to have 20 acres of woodland adjoining and lying between his other land and that of son Simon Blake, also silver watch. Son Henry Blake now of Kentucky to receive $1,000.00 to be paid him by Simon in consequence of farm sold to him by me, $150.00 annually until the whole is paid. Grand­son John Righart $100.00 to be paid by Simon one year after date. Grandchild Ann Blake daughter of son Thomas $50.00; grandchild Sarah Blake daughter of Thomas Blake $75.00 also my bureau." This will was probated Aug. 28, 1845. The 1830 U. S. Census shows there is a James Blake living in Woodbury Twp., Huntingdon Co., PA. 1 Male 30-39, 1 Male 15-19, 1 Male 10-14, 1 Female 30-39, 1 Female 10-14, and 2 Females 5-9. The 1850 U. S. Census taken on August 28, 1850 shows Nancy Blake (age 49) born in Pennsylvania with real estate worth $2,500 is living in Martinsburg Borough, Blair Co., PA. Living with her are the following, all born in Pennsylvania: Samuel Blake (age 19) a Farmer; Elizabeth Blake (age 15); Eston Blake (age 9); and Nancy Blake (age 6). The 1850 U. S. Census taken on August 28, 1850, shows Sarah Miller (age 41) born in Pennsylvania is living in Martinsburg Borough, Blair Co., PA. Living with her is Columbus Miller (age 1) born in Pennsylvania. 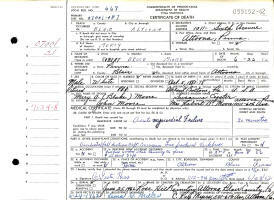 Also living there are: Polly Blake (age 64) born in Pennsylvania; and Simon Blake (age 26) born in Pennsylvania. Polly is the third wife of Simon's grandfather, James Blake, and is therefore Simon's step-grandmother. The 1850 U. S. Census taken on November 26, 1850, shows James Blake (age 55) born in Pennsylvania, and with Real Estate of $200 is a Founder, and is living in Juniata Twp., Blair Co., PA. Living with him are: Sarah Blake (age 22) born in Pennsylvania; Andrew J. Blake (age 5) born in Pennsylvania; and Berryhill Blake (age 9/12) born in Pennsylvania. The 1850 U. S. Census taken on August 13, 1850, shows Jacob Moyers (age 21) born in Pennsylvania is a Laborer and is living in Huston Twp., Blair Co., PA. Living with him are: Adeline Moyers (age 22) born in Pennsylvania; James M. Moyers (age 1) born in Pennsylvania; and Martha Blake (age 13) born in Pennsylvania. The 1850 U. S. Census taken on August 16, 1850, shows Emiline Blake (age 19) born in Pennsylvania, is living in the Michael Berry household, North Woodbury, Blair Co., PA. The 1850 U. S. Census taken on August 13, 1850 shows James Blake (age 32) born in Maryland is a Laborer is living in Huston Twp., Blair Co., PA. Living with him is Susan Blake (age 20) born in Pennsylvania. Also living there are children, all born in Pennsylvania: Jane Blake (age 12); Susan Blake (age 10); William B. Blake (age 9); James Blake (age 7); Mary A. Blake (age 4); and Henry Blake (age 2). The census enumerator was Henry Reigart. 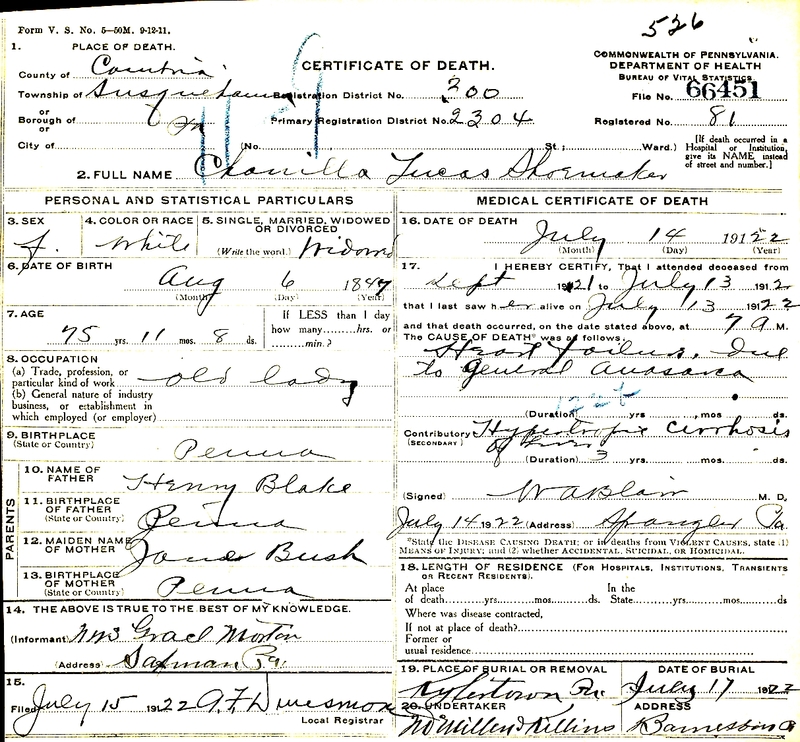 James Blake Jr. died 1859 in Huston Twp., Blair Co., PA, at about age 66. Buried in Rodman Cemetery, Roaring Spring, Blair Co., PA. The 1860 U. S. Census taken on June 25, 1860, shows Miles Stratton (age 16) born in Pennsylvania, is a Head of Household, and is living in Union Twp., Centre Co., PA. Living with him are: Henry Blake (age 46) born in Pennsylvania, and with personal estate of $200, a Laborer; Jane Blake (age 46) born in Pennsylvania; James Blake (age 23) born in Pennsylvania; Sarah Blake (age 20) born in Pennsylvania; Ann E. Blake (age 19) born in Pennsylvania; Martha Blake (age 17) born in Pennsylvania; Margara Blake (age 16) born in Pennsylvania; William Blake (age 14) born in Pennsylvania; Luella Blake (age 12) born in Pennsylvania; Mary Blake (age 6) born in Pennsylvania; and Thompson Blake (age 5) born in Pennsylvania. The 1860 U. S. Census taken on June 23, 1860, shows Sarah Blake (age 31) born in Pennsylvania, and with Personal Estate of $50 and who cannot read or write, is a Head of Household, and is living in Hopewell Twp., Blair Co., PA. Living with her are: Arabell Blake (age 8) born in Pennsylvania; and John James Blake (age 1) born in Pennsylvania. The 1860 U. S. Census taken on June 1, 1860, shows Wesley Runk (age 48) born in Pennsylvania, and with Real Estate of $1,000 is a Tailor, and is living in Rush Twp., Centre Co., PA. Living with him are: Mary Ann Runk (age 47) born in Pennsylvania; Matilda Runk (age 20) born in Pennsylvania; Edward Runk (age 13) born in Pennsylvania; Helen Runk (age 9) born in Pennsylvania; and Henrietta Runk (age 5) born in Pennsylvania. 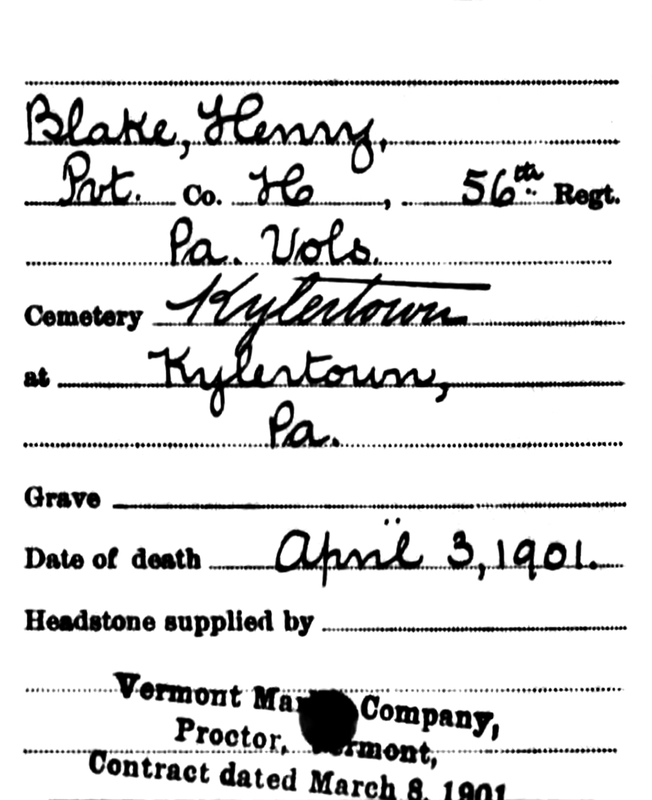 Henry Blake was a Private in Co H, 56th Regiment PA Volunteers, per cemetery records. 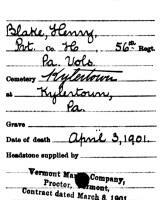 Henry Blake, Union Twp., a Private, Enlisted October 1, 1861; Discharged January 20, 1865. 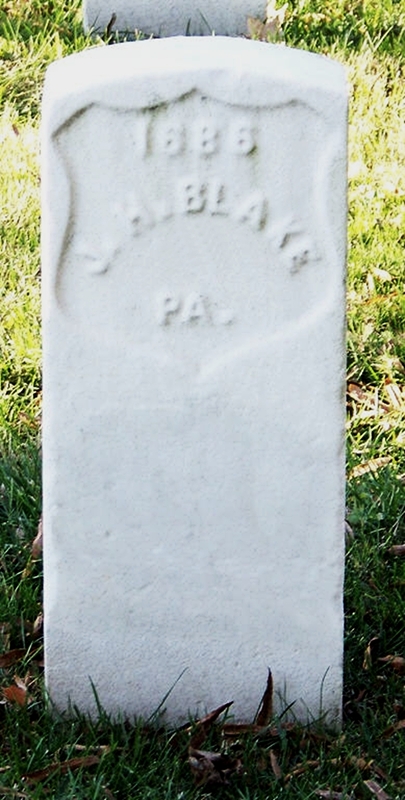 James H. Blake, a Private, Enlisted October 1, 1861, in Co H, 56th Regiment PA Volunteers; Accidentally wounded July 21, 1862; Died October 5, 1862. Buried at Military Asylum Cemetery, Washington, DC. James H. Blake died October 5, 1862, in Mt. Pleasant G H, Washington, DC, at about age 25. Buried in U. S. Soldiers' and Airmen's Home National Cemetery, Washington, DC. The 1870 U. S. Census taken on June 7, 1870, shows Henry Blake (age 54) born in Maryland, and with Personal Estate of $250, is a Farmer, and is living in Union Twp., Centre Co., PA. Living with him are: Jane J. Blake (age 54) born in Pennsylvania, who is Keeping House; Sarah J. Blake (age 32) born in Pennsylvania; Thompson Blake (age 15) born in Pennsylvania, who Works on Farm; and Lola Monty Blake (age 2) born in Pennsylvania. The 1870 U. S. Census taken on August 15, 1870, shows Wesley Runk (age 54) born in Pennsylvania, and with Real Estate of $12,000 and Personal Estate of $700, is a Clerk in a Store, and is living in Philipsburg Borough, Centre Co., PA. Living with him are: Mary A. Runk (age 53) born in Pennsylvania, who is Keeping House; Helen Runk (age 19) born in Pennsylvania; and Henrietta Runk (age 15) born in Pennsylvania. Norman F. Throne was born September 9, 1871, in Pennsylvania. Buried in Mountain View Cemetery, Ashland, Jackson Co., OR. Jane P. (Bush) Blake died February 11, 1873, in Union Twp., Centre Co., PA, at age 57. Buried in Bush Hollow Cemetery, Centre Co., PA.
Wesley Runk died February 24, 1877, in Philipsburg, Centre Co., PA, at age 62. Buried in Philipsburg Cemetery, Philipsburg, Centre Co., PA.
Mary Ann (Stage) Runk died December 3, 1879, in Philipsburg, Centre Co., PA, at age 65. Thompson Milligan Blake and Henrietta "Nettie" Runk were married about 1879 in Philipsburg, Centre Co., PA. The 1880 U. S. Census taken on June 1, 1880, shows M. Blake (age 25) born in Pennsylvania to Pennsylvania-born parents, is a married Coal Miner, and is living in Philipsburg Borough, Centre Co., PA. Living with him is his wife, Nettie Blake (age 24) born in Pennsylvania to Pennsylvania-born parents. The 1880 U. S. Census taken on June 17, 1880, shows Isaac Shoemaker (age 39) born in New York to New York-born parents, is a married Foreman at a Sawmill, and is living in Huston Twp., Clearfield Co., PA. Living with him are: his wife, Cherilla Shoemaker (age 35) born in Pennsylvania to Maryland and Pennsylvania-born parents, who is Keeping House; his unmarried son, Joseph Shoemaker (age 16) born in Pennsylvania to New York and Pennsylvania-born parents, who Works in a Sawmill; his daughter, Grace Shoemaker (age 2) born in Pennsylvania to New York and Pennsylvania-born parents; and his widower father-in-law, Henry Blake (age 64) born in Maryland to Pennsylvania-born parents. The 1880 U. S. Census taken on July 1, 1880, shows Andrew J. Arnot (age 29) born in New York to New York and New Jersey-born parents, is a married Laborer, and is living in Eldred, McKean Co., PA. Living with him are: his wife, Mary M. Arnot (age 27) born in Pennsylvania to Maryland and Pennsylvania-born parents, who is Keeping House; his son, Eddie Arnot (age 1) born in Kansas to New York and Pennsylvania-born parents; and his stepdaughter, Alice Waters (age 6) born in Pennsylvania to South Carolina and Pennsylvania-born parents. Mary A. "Mamie" Blake was born June 22, 1884, in Philipsburg, Centre Co., PA.
Norman F. Throne and Alice Elizabeth Waters were married about 1894 in Pennsylvania. Robert Franklin Throne was born January 17, 1895, in Marcus Hook, PA. The 1900 U. S. Census taken on June 4, 1900, shows Norman Throne (age 28) born September, 1881, in Pennsylvania to Pennsylvania-born parents, is a married Clerk in a Gas Office, and who rents his home, and is living in Fallowfield, Charleroi Borough, Washington Co., PA. Living with him is his wife of 6 years, Alice Throne (age 26) born April, 1874, in Pennsylvania to Pennsylvania-born parents, and with all 3 of the children born to her still alive; his son, Robt. T. Throne (age 6) born January, 1894, in Pennsylvania to Pennsylvania-born parents; his daughter, Thelma T. Throne (age 4) born June, 1895, in Pennsylvania to Pennsylvania-born parents; and his son, Alvin M. Throne (age 1) born June, 1898, in Pennsylvania to Pennsylvania-born parents. The 1900 U. S. Census taken on June 11, 1900, shows Isaac Shoemaker (age 60) born September, 1839, in New York to New York-born parents, is a married Miller, and who owns his farm free of a mortgage, and is living in Kylertown Pct., Cooper Twp., Clearfield Co., PA. Living with him are: his wife of 35 years, Charrilla Shoemaker (age 53) born February, 1847, in Pennsylvania to Maryland and Pennsylvania-born parents, and with 1 of the 4 children born to her still living; his widower father-in-law, Henry Blake (age 84) born November, 1815, in Maryland to Pennsylvania-born parents, and married for 60 years; a married Boarder, Thompson Blake (age 44) born October, 1855, in Pennsylvania to Maryland and Pennsylvania-born parents, and married for 3 years, a Stationary Engineer; his granddaughter, Margrette Morton (age 4) born March, 1896, in Pennsylvania to Pennsylvania-born parents; and a divorced Boarder, Christ Shadduck (age 54) born July, 1845, in New York to New York-born parents, and married for 20 years, a Carpenter. 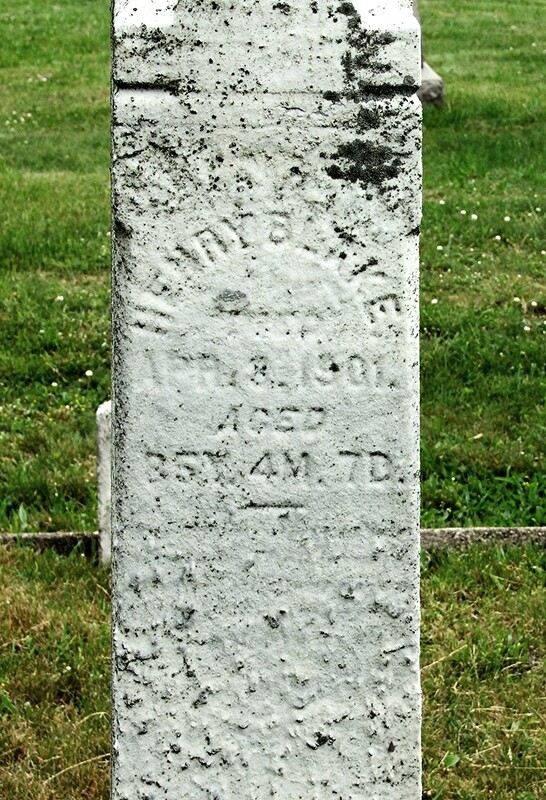 Henry Blake died April 3, 1901, in Clearfield, Clearfield Co., PA, at age 85. Buried in Kylertown Presbyterian Cemetery, Morrisdale, Clearfield Co., PA.
Robert Bruce Moore and Mary A. "Mamie" Blake were married February 23, 1905, in Altoona, Blair Co., PA.
Robert Bruce Moore and Mary A. 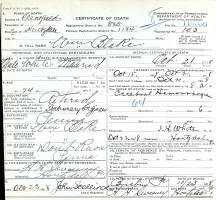 "Mamie" Blake Marriage Record. The 1910 U. S. Census taken on April 15, 1910, shows Charrilla Shoemaker (age 61) born in Pennsylvania to Maryland and Pennsylvania-born parents, and with 1 of the 4 children born to her still living, and who owns her farm free of a mortgage, is a widowed Head of Household, and is living in Kylertown Pct., Cooper Twp., Clearfield Co., PA. Living with her is her widower brother, Milligan Blake (age 54) born in Pennsylvania to Maryland and Pennsylvania-born parents, a Fireman at a Sawmill. The 1910 U. S. Census taken on May 2, 1910, shows Andrew J. Arnot (age 59) born in New York to New York and At Sea-born parents, and in his first marriage, is a married Common Mill Laborer, and who owns his home free of a mortgage, and lives in Cooston, North Marshfield Pct., Coos Co., OR. Living with him are: his wife of 35 years, Mary M. Arnot (age 57) born in Pennsylvania to Pennsylvania-born parents, and in her 2nd marriage, and with 7 of the 10 children born to her still living; his married son, Edward E. Arnot (age 34) born in Kansas to New York and Pennsylvania-born parents, a Laborer at a Mill; his married son, Edward E. Arnot (age 34) born in Kansas to New York and Pennsylvania-born parents, and in his first marriage, a Laborer at a Mill; his unmarried son, Boyd Arnot (age 18) born in Pennsylvania to New York and Pennsylvania-born parents, a Laborer at a Mill; his married daughter, Alice Thorne (age 36) born in Pennsylvania to Pennsylvania-born parents, and in her first marriage, and with all 3 of the children born to her still alive; and his grandson, Paul Arnot (age 18) born in Pennsylvania to Kansas and Pennsylvania-born parents. Norman F. Throne died August 8, 1913, in Ashland, OR, at about age 38. William Blake died October 21, 1918, in Houtzdale, Clearfield Co., PA, at age 73. Charilla Lucas (Blake) Shoemaker died July 14, 1922, in Susquehanna, Cambria Co., PA, at age 74. 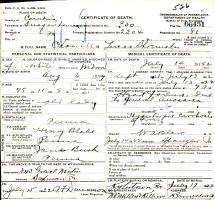 Buried in Kylertown Presbyterian Cemetery, Morrisdale, Clearfield Co., PA.
Charilla Lucas (Blake) Shoemaker Death Record. Mr. and Mrs. Howard Gildea of McMinnville spent Easter weekend in Roseburg visiting Mrs. Gildea's mother, Mrs. W. J. Clark, and brother and sister-in-law, Mr. and Mrs. A. M. Throne. Mrs. Gildea was Miss Thelma Throne of Roseburg before her marriage and has a wide circle of friends in the city. Andrew James Arnot died November 9, 1929, in Roseburg, Douglas Co., OR, at age 78. Buried in Sunset Memorial Park, Coos Bay, Coos Co., OR. Andrew James Arnot died early this morning at the home of his daughter, Mrs. W. J. Clark, 726 Mill street. He came here from Marshfield three weeks ago on a visit, his wife accompanying him. He became quite ill and his condition gradually became worse until his death today. He was born at Almyra, N. Y., November 18, 1850, and was nearly 79 years of age. He served during the Civil was with Co. A, 45th Pennsylvania infantry. He is survived by a widow and four children, Mrs. W. J. Clark of Roseburg, E. C. Arnot of North Bend, Mrs. F. L. Bourne of Portland and Boyd L. Arnot of Marshfield. There are ten grandchildren. M. E. Ritter of the Roseburg Undertaking company is arranging to take the body to Marshfield tomorrow, and funeral services will be held there on Monday. Arnot. - Andrew James Arnot was born Nov. 18, 1850, at Elmira, N. Y.; and passed away at the home of his daughter in Roseburg, Oregon, Nov. 9, 1929. He served in the Union army, receiving an honorable discharge; after which he was married to Mary M. Blake and settled at Cooston, Oregon, in 1906. Last April they celebrated their golden wedding anniversary in the presence of their six children and many friends, who besides his companion, are left to mourn their loss. Words of comfort were spoken by the writer from Heb. 4:13-16. Thelma L. Throne was married June 27, 1923, in Yamhill Co., OR, to Howard Cecil Gildea. Thelma L. Gildea in 1930, McMinnville, OR. 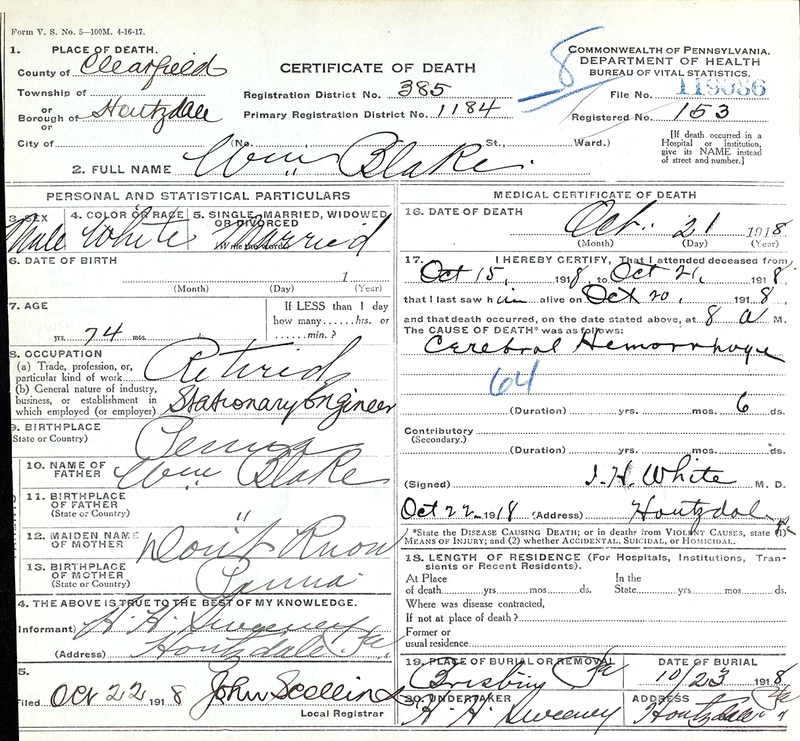 The 1930 U. S. Census taken on April 12, 1930, shows William J. Clarke (age 56) born in English Canada to English Canada-born parents, and first married at age 22, and who owns his home free worth $1,200 is a married Steam Railroad Conductor, and is living at 726 Mill Street, 3rd Ward City of Roseburg, Woodward Pct., Douglas Co., OR. Living with him is wife, Alice E. Clarke (age 56) born in Pennsylvania to Pennsylvania-born parents, and first married at age 20. Howard Cecil Gildea: Born October 8, 1889, in Spokane, Spokane Co., WA; Died April 8, 1931, in McMinnville, Yamhill Co., OR (age 41). Howard C. Gildea, attorney of McMinnville for the last 15 years, and well known in Salem, died there Wednesday. Mr. Gildea was prominent in American legion affairs and in the Kiwanis club, having served as president of the McMinnville club. He is survived by his widow and two small sons, by his father, C. C. Gildea of Oregon City; a brother, C. O. Gildea of Oregon City; and a sister, Mrs. Walter J. Nelson of Salem. Funeral arrangements are to be announced later. Alice Elizabeth (Waters) (Throne) Clarke died June 5, 1935, in Roseburg, Douglas Co., OR, at age 63. Buried in Roseburg Memorial Gardens, Roseburg, Douglas Co., OR. News of the death Tuesday of last week of Mrs. Alice Elizabeth Clarke, 64, mother of Mrs. Thelma Gildea, was received here from Roseburg this week. Mrs. Gildea was called to the southern Oregon city recently to assist in the care of her mother. Surviving are the widower, William J. Clarke; a son, A. L. Throne of Medford; a daughter, Mrs. Gildea of this city; two brothers, Ed Arnot of North Bend and Roy Arnot of Cooston, and a sister, Mrs. Fred Bourns of Portland. Alice Elizabeth Throne and William John Clarke were married November 27, 1919, in Victoria, British Columbia, Canada. 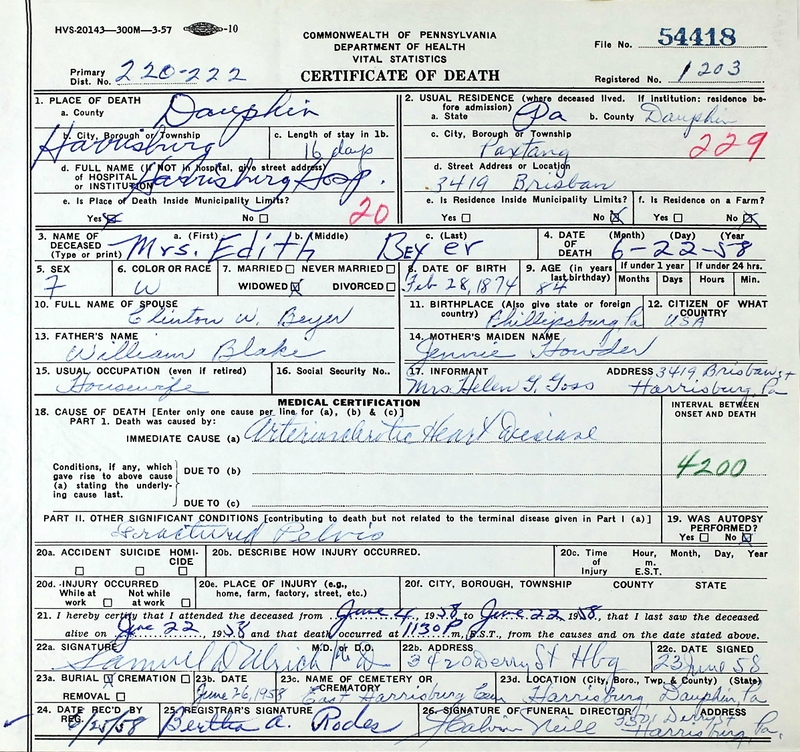 Edith (Blake) Beyer died June 22, 1958, at Harrisburg Hospital, Harrisburg, Dauphin Co., PA, at age 84. 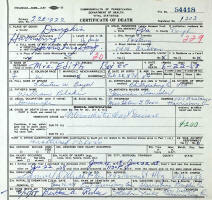 Buried in East Harrisburg Cemetery, Harrisburg, Dauphin Co., PA.
Edith (Blake) Beyer Death Record. Thelma Lou (Waters) (Throne) (Gildea) Wilson died February 1, 1973, in Douglas Co., OR. Buried in Roseburg Memorial Gardens, Roseburg, Douglas Co., OR. Spouse is Hearald Haysting Wilson (1889 - 1979). Mary M. (Blake) (Waters) Arnot died January 22, 1935, in McMinnville, Yamhill Co., OR, at age 82. Buried in Sunset Memorial Park, Coos Bay, Coos Co., OR. Word was received here last night of the death yesterday at McMinnville of Mrs. Mary M. Arnot, mother of Mrs. W. J. Clarke of this city. Mrs. Arnot came to Roseburg in 1905 and resided here for several years. Recently she has been with her granddaughter, Mrs. Thelma Throne Gildea, in whose home the death occurred. Surviving Mrs. Arnot are two daughters, Mrs. Clarke of Roseburg, and Mrs. F. L. Bourne of Portland, and two sons, F. C. Arnot of Reedsport and B. L. Arnot of Cooston. Burial will take place at Sunset cemetery in Marshfield, where her husband and a son, Frank, are buried. Robert Bruce Moore died June 22, 1962, at Mercy Hospital Altoona, Blair Co., PA, at age 78. 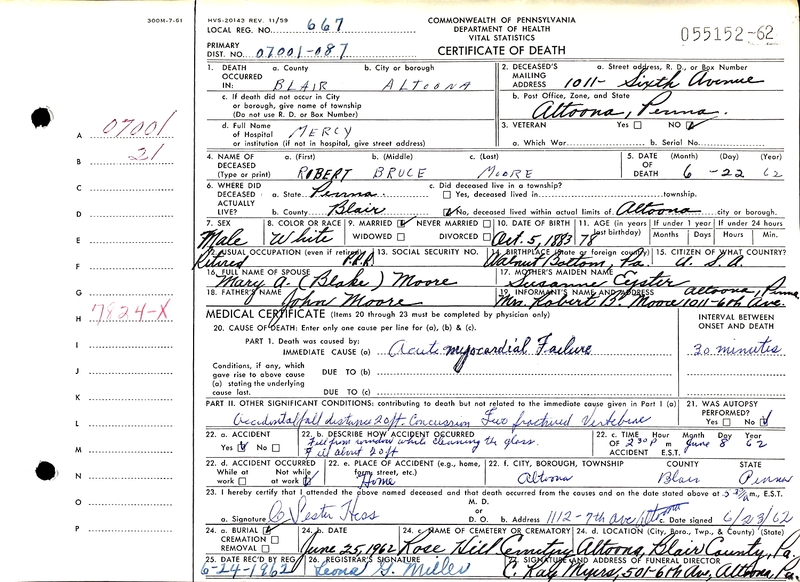 Buried in Rose Hill Cemetery, Altoona, Blair Co., PA.
Robert Bruce Moore Death Record. Mary A. "Mamie" (Blake) Moore died January 22, 1966, in Altoona, Blair Co., PA, at age 78. Buried in Rose Hill Cemetery, Altoona, Blair Co., PA.
MRS. MARY A. MOORE Of 3030 5th Ave., died at 6:45 a.m. today in her home after a brief illness. She was born in Philipsburg on June 22, 1884, a daughter of Milligan and Henrietta (Runk) Blake, and married Robert B. Moore, who died June 22, 1962. Surviving are eight children, Mrs. Ethel Reany of Jupiter, Fla., Mrs. Lorena Orner, Robert B. and Raymond M. of the city, Mrs. Natalie Freshman of Huntingdon Woods, Mich., Mrs. Dorothy Price of Springfield, Mass., Mrs. Mary Smith of Mountain Lakes, N.J., and Edwin M. of Miami, Fla.; nine grandchildren and four great-grandchildren. She was a member of the First Church of Christ, Bible Class 12, and Ruth Society, and of Altoona Chapter, O.E.S. Friends will be received in the Myers Funeral Home from 7 to 10 p.m. tomorrow, 2 to 4 and 7 to 10 p.m. Monday. 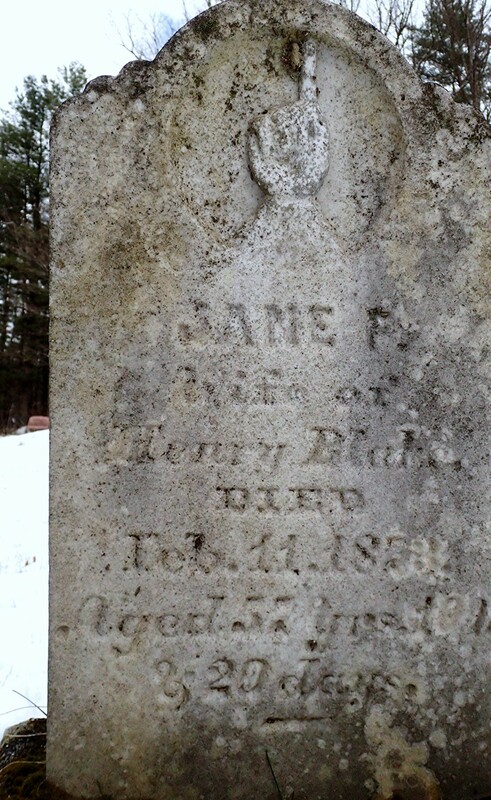 Annie E Blake was born Jan 27, 1840 to Henry Blake (1815 MD - 1901 Clearfield PA) and Jane Bush (1814 PA - died before 1880). Annie was the 3rd eldest of 10 siblings. The Blake's lived in Clarion PA (1850) and Union, Centre PA (1860). Anna married Rufus D. Stratton (son of John & Jane Hoover Stratton) in 1862 in Centre County. Annie's older brother James H Blake (1837-1862) married Rufus' Aunt Hannah Stratton (1835-1906, the daughter of William Stratton & Mary Evans) in 1860. James H Blake died in the civil war and is buried in Washington DC (as is Rufus' brother John Stratton 1846-1862). After Rufus returned from serving in the Civil War, they had 2 sons born in Centre Co - Miles E & Harvey E. The family moved to Iowa in the 1870's along with several of Annie's siblings. The Strattons returned to Pennsylvania residing in Morris, Clearfield PA for a time and then moving to Wilkes-Barre PA around 1901. Her sons both worked for the USPS in Wilkes-Barre. Anna died at her residence, 374 Academy St, Wilkes-Barre PA on July 27, 1927. Per her obituary she was survived by 2 sons - Harvey at home with whom she resided and Miles of Pittsburgh. Also survived by a sister Mrs. Mary M Arnot of Oregon and a brother Milligan Blake of Emmono PA and several grandchildren and great grandchildren. Note: Anna is linked to her father buried at Kylertown Cemetery in Clearfield whose grave info is incorrect on this site (age 85, not 35 is engraved in stone and verified by his death record). Her brother T. Mulligan and sister Charilla (Blake) Shoemaker are also buried there.